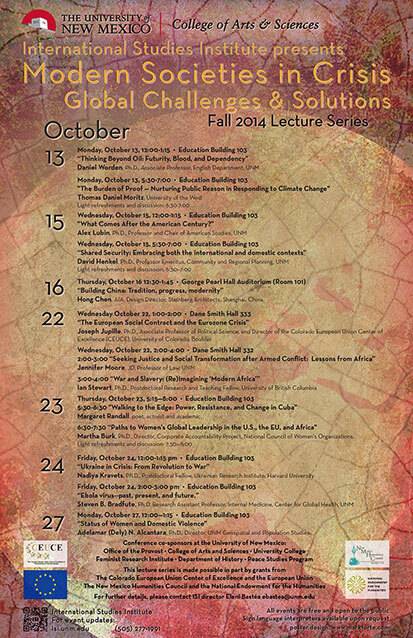 “Modern Societies in Crisis: Global Challenges and Solutions,” October 13—27, 2014. All events are free and open to the public. They are held at the College of Education Classroom 103, George Pearl Hall 101 (Architecture Building), and Dane Smith Hall. “Thinking Beyond Oil: Futurity, Blood, and Dependency"
Daniel Worden, Ph.D., Associate Professor, English Department, UNM. "The Burden of Proof -- Nurturing Public Reason in responding to Climate Change,"
Thomas Daniel Moritz, University of the West. Hong Chen, AIA, Design Director, Steinberg Architects, Shanghai, China. Joseph Jupille, Ph.D., Associate Professor of Political Science, and Director of the Colorado European Union Center of Excellence (CEUCE). University of Colorado, Boulder, CO.
"Walking to the Edge: Power, Resistance, and Change in Cuba"
Margaret Randall, poet, activist and academic. “Paths to Women's Global Leadership in the U.S., the EU, and Africa"
Martha Burk, Ph.D., Director, Corporate Accountability Project, National Council of Women’s Organizations. Nadiya Kravets, Ph.D.,Postdoctoral Fellow, Ukrainian Research Institute & Davis Center for Russian and Eurasian Studies, Harvard University. Adelamar (Dely) N. Alcantara, Ph.D., Director, UNM Geospatial and Population Studies.